Inasal is an Ilonggo word meaning “to grill.” Traditional inasal uses chicken, pork, or fish, rather than beef. Top sirloin or top blade steak are the preferred cuts for kebabs. 1. In a large nonreactive bowl, mix together the soy sauce, soda, juice, garlic, onion, brown sugar, and pepper. Add the beef and mix well to coat. Cover with plastic wrap and marinate in the refrigerator for 1 to 3 hours. 2. Soak 16 wooden skewers in water for at least 1 hour. 3. To grill the kebabs, prepare a medium charcoal fire (you can hold your hand over the rack for no more than 3 or 4 seconds) with the rack 4 to 6 inches from the coals, or preheat a gas grill to medium. To broil the kebabs, position a rack about 4 inches from the heat source and preheat the broiler. 4. 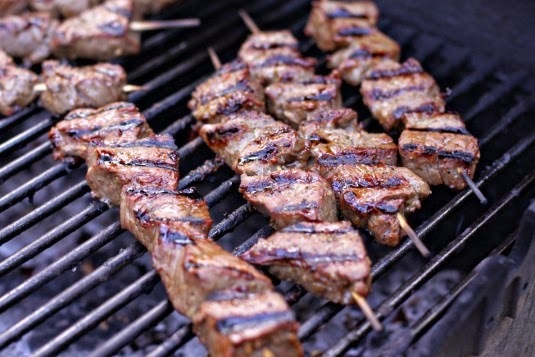 While the grill or broiler is heating, thread 4 to 5 steak pieces onto each skewer. Set aside to let the excess marinade drip off. Reserve a small portion of the marinade for basting. 5. If you are grilling, brush the grilling rack with vegetable oil and place the kebabs on top. Grill for 8 to 10 minutes in total for medium, or until the beef is cooked to desired doneness. Turn the kebabs 2 or 3 times to cook all surfaces and baste frequently with reserved marinade in the first 5 minutes of cooking. 6. If you are broiling, brush the broiler pan with vegetable oil and place the kebabs in one layer (you may have to broil them in batches). Broil for 3 to 4 minutes on each side for medium, or until the beef is cooked to desired doneness. Baste once or twice with the reserved marinade in the first 5 minutes of cooking. 7. Place the kebabs on a serving platter and tent loosely with foil. Let the meat rest for 5 minutes.